Well, we did something a little bit different today. I got a new sensory bin set up and the mood struck me to share it with you all... right then and there. So off to Facebook I went and did a live video. If you missed it, you can watch it here. Don't forget to like the Crayon Freckles page while you're there for more great ideas! If you missed the video, here's the jist of it. 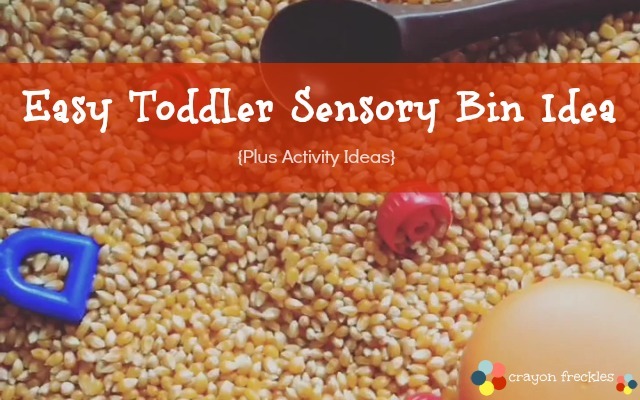 It's a super easy sensory bin for toddlers. I dumped 6 bags of popcorn kernels into an under the bed storage bin, tossed in a few caps from fruit squeeze pouches, some scoops and let Sunny (27 months) explore. This activity is also fun because it has a fall feel to it with the corn and the red caps that resemble apples. It could definitely be used with an apple themed curriculum. Hide the caps in the kernels and then go looking for them. Use an ice cream scoop to dig the caps out and put them in a bowl. Count how many scoops it takes to fill up a small bowl. Use tongs to pluck the caps out of the kernels. Take turns "burying" each other's hands. It's such a struggle when I hear moms talk about how hard it is to find the time to plan and set up activities for their kids. Don't let social media trick you into thinking that anything less than Pinterest-Perfect isn't acceptable. Our kids won't remember all the details. They're going to remember spending time with you. So go easy on yourself.